Goodyear Tyre and Rubber Company was first established in 1898 as a manufacturing firm for bicycles. The company was founded by Charles Goodyear and from 1916, it has started to produce tyre for different vehicles. Today, it is known as one of the largest tyre manufacturing company in the world with its offices in all over the world, across six continents and annually the company has a revenue of around $16 billion. Goodyear aims to create high- quality tyre that will provide both comfort and safety. The company manufactures different types of tyres such as all- season, summer and winter tyres for all types for vehicles. Goodyear Eagle F1 Asymmetric 2 is a summer tyre that has a special rubber compound made of silica that provides excellent traction between the surface of the road and the tyre. It consists of wide longitudinal grooves that enable the water to flow smoothly and quickly, while driving through wet road conditions, thwarting the risk of aquaplaning. The tyre provides low rolling resistance resulting in low fuel consumption and hence this decreases the emission of carbon in the atmosphere. 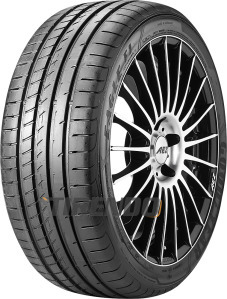 Goodyear Eagle F1 Asymmetric 2 is available in many sizes which include:Goodyear Eagle F1 Asymmetric 2 215/45 R 17 - The tyre has a noise decreasing system which allows a quiet and comfortable ride and consists of a special rubber compound that provide better grip in both wet and dry road conditions. The tyres have a mileage of one- hundred and eighty six kilometers per hour, gaining a speed rating of Y. The tyre provides better performance at high speeds without causing any sort of distortion. The tyres of Goodyear follow the guidelines given by the European Union and also bears a label of the European Union.